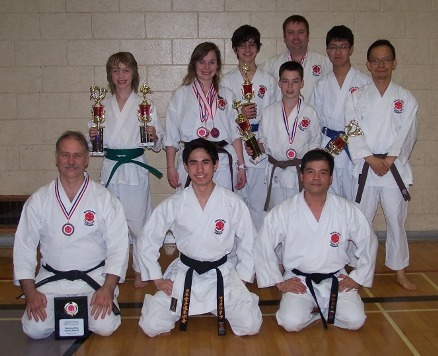 The Deep River Karate Club is strictly a non-profit organization; all instructors are volunteers who, after practicing for a number of years, became qualified for teaching. Adult black-belts are in charge of teaching, and are assisted by junior black-belts or other senior students, who teach as part of their own training. For current fees see the Registration Form. MEMBERSHIP FEES ARE NON-REFUNDABLE, SO PLEASE BE SERIOUS ABOUT SIGNING UP. A uniform, called a Gi, is required and it costs about $40. They may be purchased through the club or at sports stores in Ottawa or online. 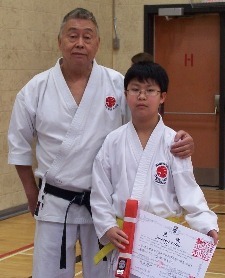 The uniform and a club crest are mandatory for all gradings and tournaments. Club crests are available from the instructors for $25.00, the club cost from the parent organization. These costs are approximate. Up to twice annually, usually November and May/June. Exact dates will be communicated in advance. Note that junior students are graded once a year. Cost for the grading is subject to change, but is typically about $80 if you pass or a fee of $10 if you fail to cover expenses. All grading payments are cash only. National and international, usually held in Toronto twice a year. We aim to take a group of students to each tournament and participation is encouraged but not mandatory. The club is not responsible for transportation to and from tournaments, although informal arrangements can usually be made. The moderate tournament fees are set according to the number of events and competitor's age group. Travel expenses are of course separate.